The ecstasy of what's in the box. 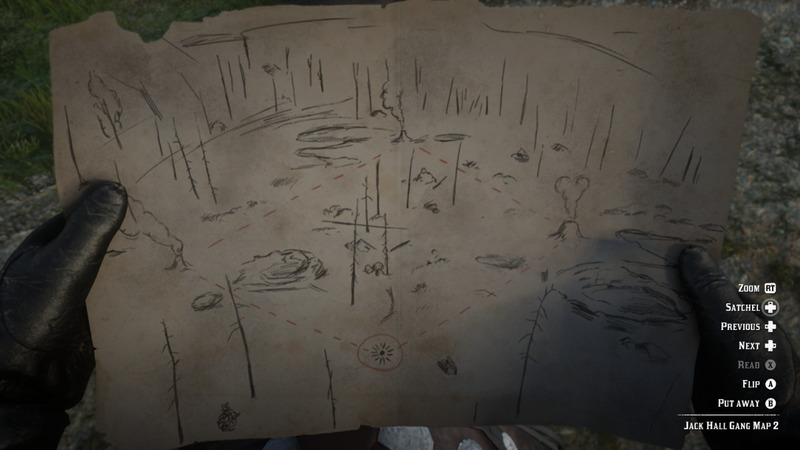 This article will also cover a couple of other Treasure Hunts that are not associated with the Explorer Challenges. If there's a map, it's going to be in this article. Also like the other challenges in this game it's best to pace yourself throughout the story. I'll list when the best time to do the perspective prospecting. 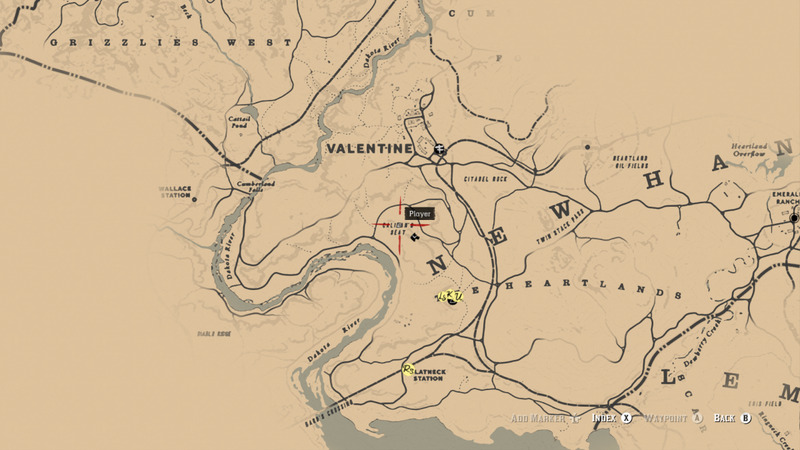 The closest, and earliest, Treasure Map is the Jack Hall Gang Map which is located near Flatneck Station, South-West of Valentine. 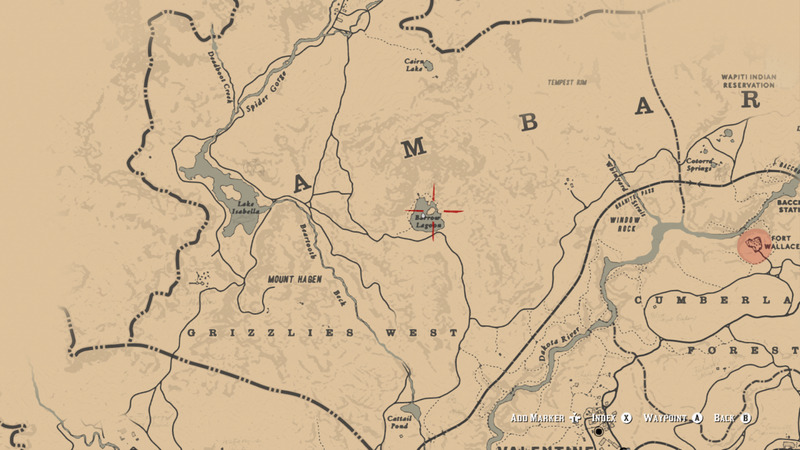 There will be a man named Maximo who you can buy the map from for $10 (or $5 if you decline his FIRST offer). 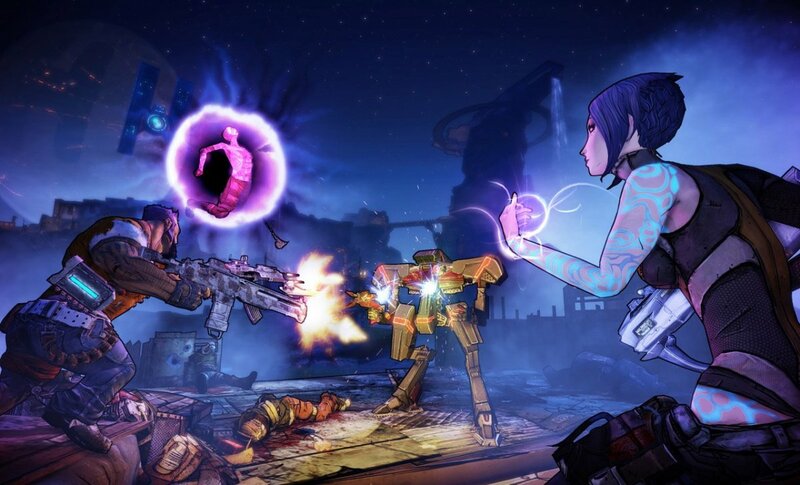 Thirdly the High Stakes Treasure can be found, through a random encounter, as early as after the Chapter 2 mission "The First Shall Be Last". For some reason a lot of YouTubers and other online sources say "not until after Chapter 3", but I can indubitably assure you that this is bull s***. 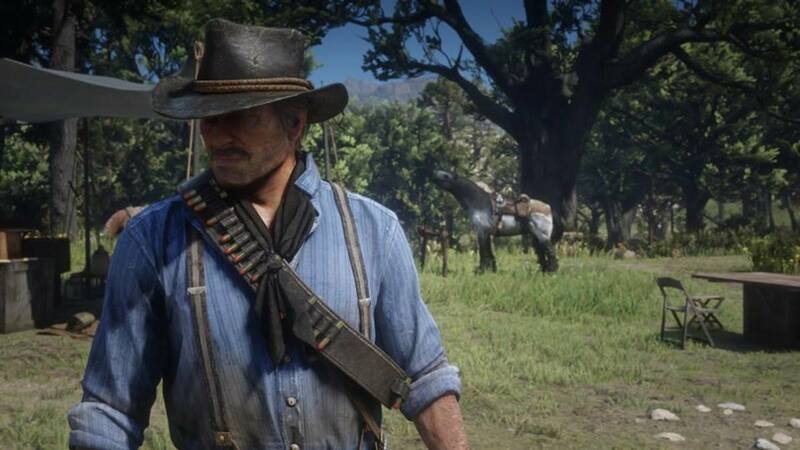 You have a great chance of running into him, after "The First Shall Be Last" as you're riding back to Dutch's Camp. 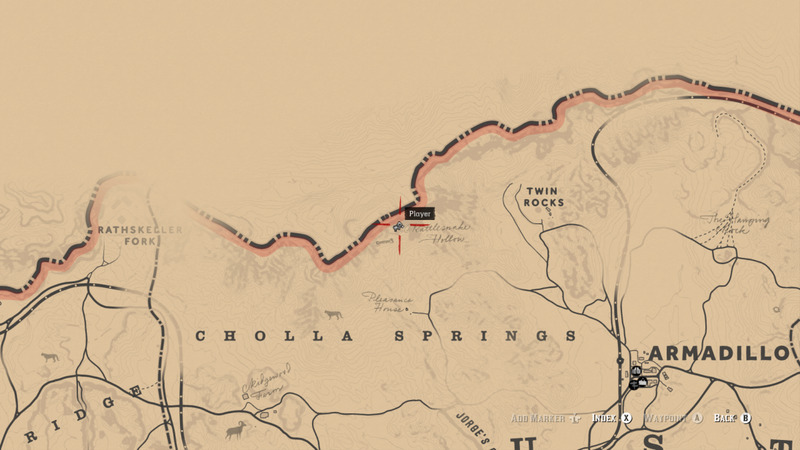 You can also trigger the encounter while heading to Strawberry, in Chapter 2, to do the mission "Blessed Are The Meek?". Anyhow once you find him use your Lasso to steal the High Stakes Treasure map from his person. 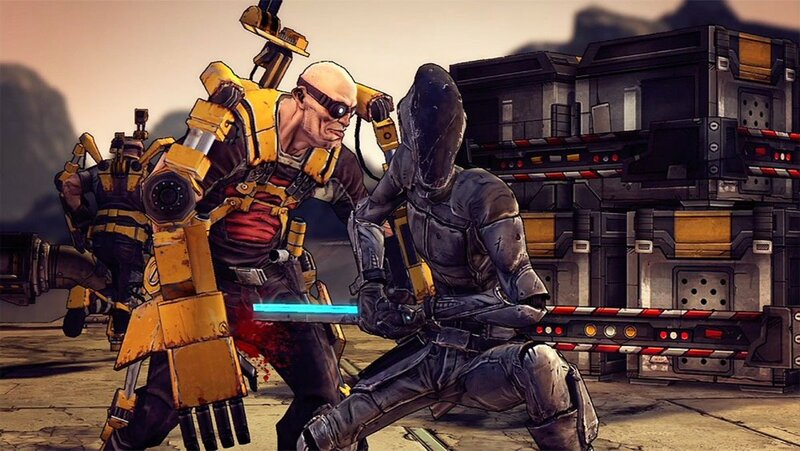 You won't lose an Honor point unless you kill him, and once/if you cut him free there won't be a confrontation. The descriptions for finding these treasures, despite having screenshots to help guide you, are written purposefully vague. I don't want to ruin the thrill of the hunt, but I want to be helpful at the same time. I'll give you directions, but if you're one of those modern kids who gets "confused" easily then this will be great for both of us! 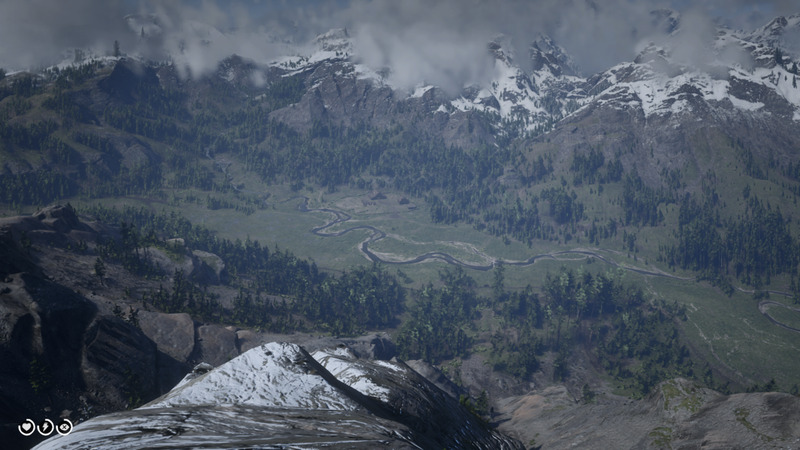 This is what you want to look for, It's North of Horseshoe Overlook (Main Camp in Chapter 2) and South of Valentine. Annnnd here's a picture of where it's exactly located on the map. Making the above directions redundant I suppose. 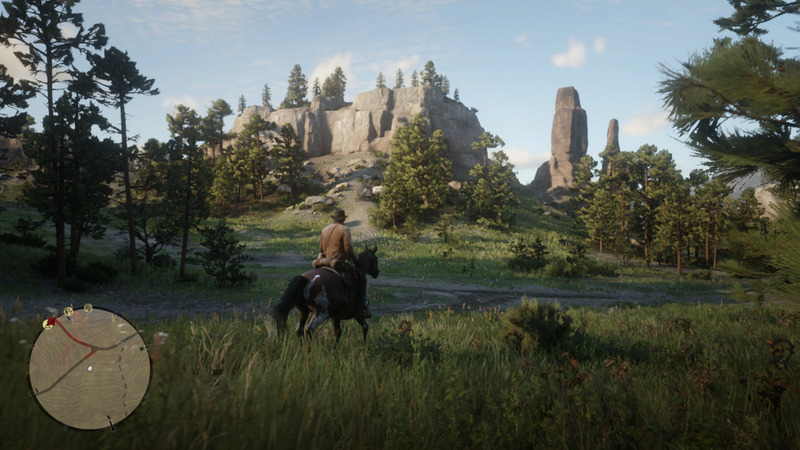 Once you reach the location in the second screenshot dismount and run up the South-West side of the mountain (note: you COULD ride up this little trail but you run the risk of harming your horse. It's best to just go on foot.) You'll see a pathway that will take you to the top of Caliban's Seat. As you run along the top you'll see a slope to the right, follow that down and go left. Follow the ledge and be prepared to do a running jump to pass the gap (or else you'll have to start this over again if you don't die that is...) Climb then drop down past the the rock wall ahead of you. 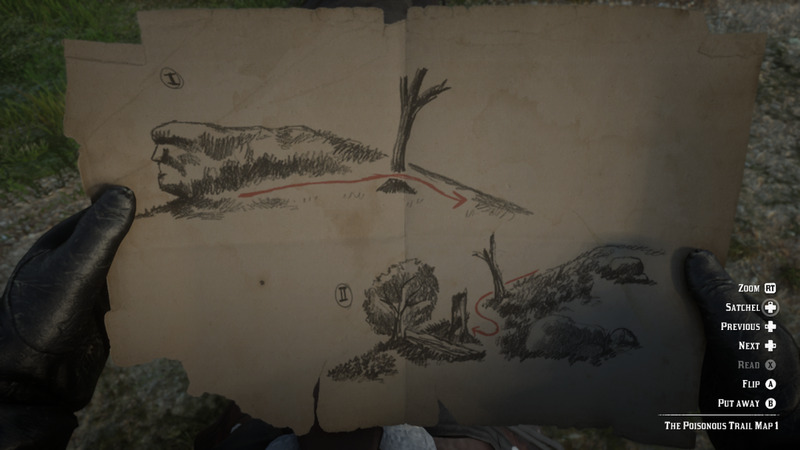 Go to the end of the ledge and press+hold X/Square collect the next Treasure Map (see below screenshot). To get back down climb back over the rock wall, then carefully drop down to the ledge (that gap to ran and jumped earlier) to somewhat carefully get back down to ground level. You don't NEED to run these geysers like bases in baseball, but I won't stop you if you're feeling it. 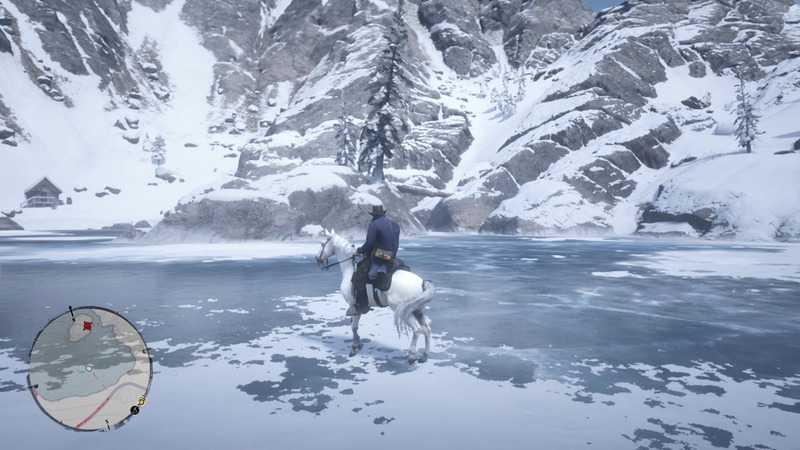 This screenshot was taken about halfway through Chapter 2, but head North of Valentine. This looks familiar doesn't it? 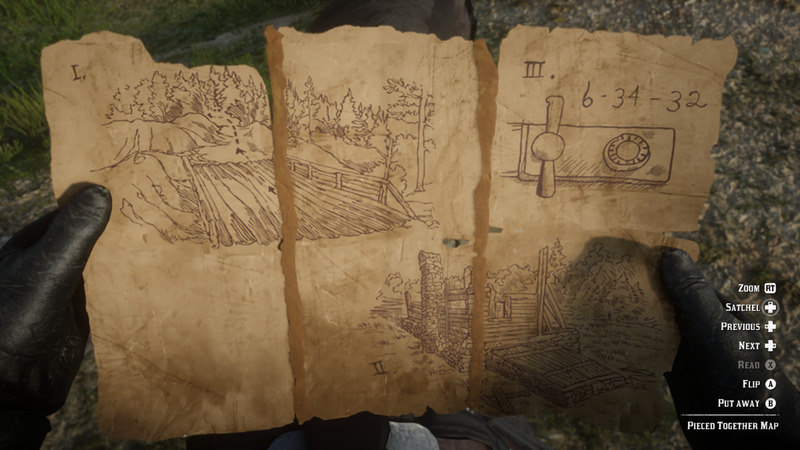 The next treasure map is up at Cotorra Springs (which by the way is also the location of the Legendary Wolf). There are three geysers here, but where you want to be is at the West end of these geysers. There will be a few rock piles at the "home base" part of the area (or would that be "home wicket" for you folks across the pond?). The treasure is in one of these piles, press+hold X/Square to search for it. 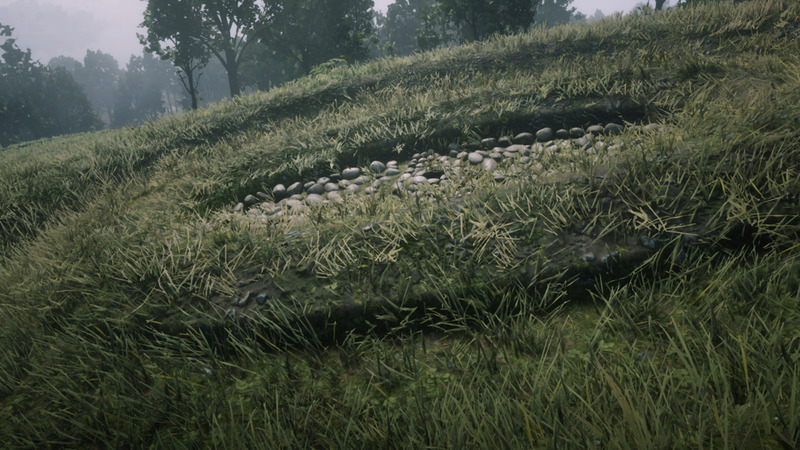 The treasure map is in THIS pile of rocks. Where is that exactly? Good luck buddy! As you look at this map, consider how many small bodies of water with mini islands there are in this game. I could have waited until the lighting was better, and weather was clearer, but damn look at this. Anyway go to that island. 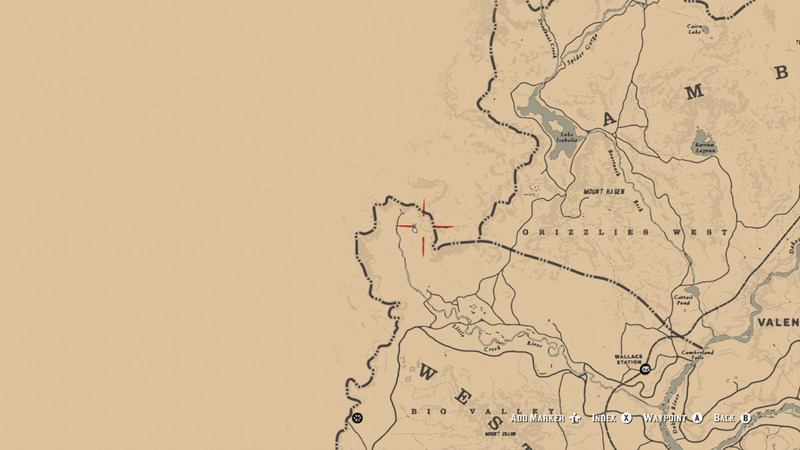 This is the area (with marker on "treasure island") just South of where you and Hosea went after the Legendary Grizzly Bear. 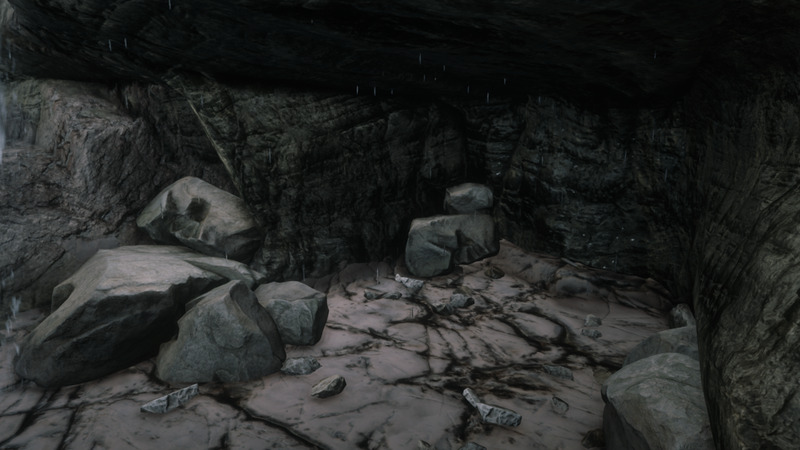 You visited O'Creagh's Run during the Chapter 2 mission "Exit Pursued By A Bruised Ego", so it should be on your map. 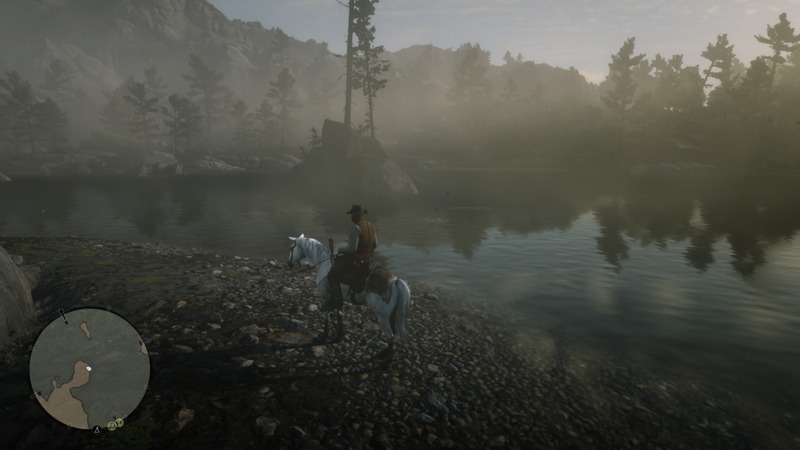 From the peninsula, on the West side of the lake, use your horse to swim out to the small long island. There will be a little platform of land you can climb up onto. Press+hold X/Square (after dismounting or you'll hear a splash) to grab the treasure under a flat rock. But which rock could it be!? Oh wait there it is! 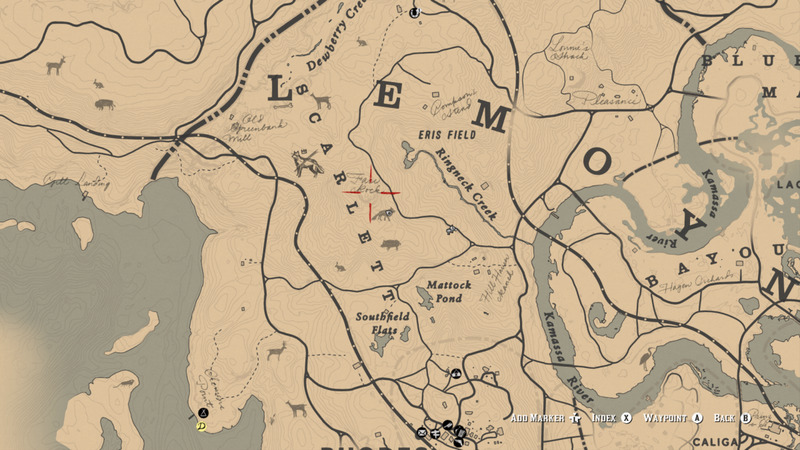 You can spot it if you're in the area trying to hunt Boar and Deer, or riding North from Rhodes. 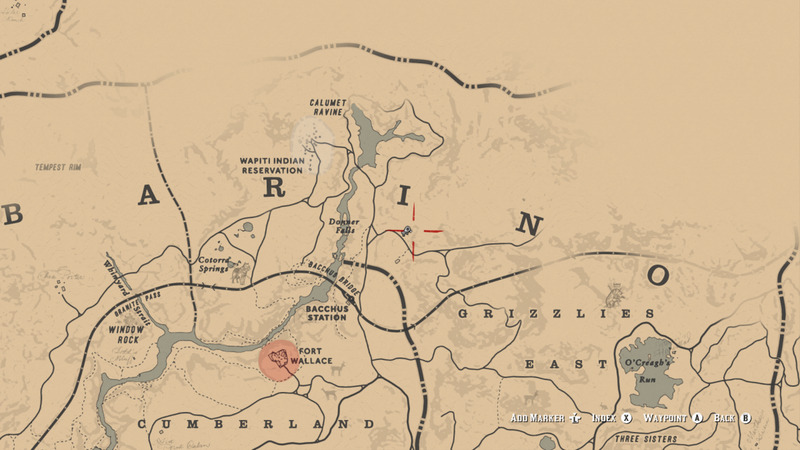 If you wait until Chapter 3 you can ride North-East from the Dutch's Camp. 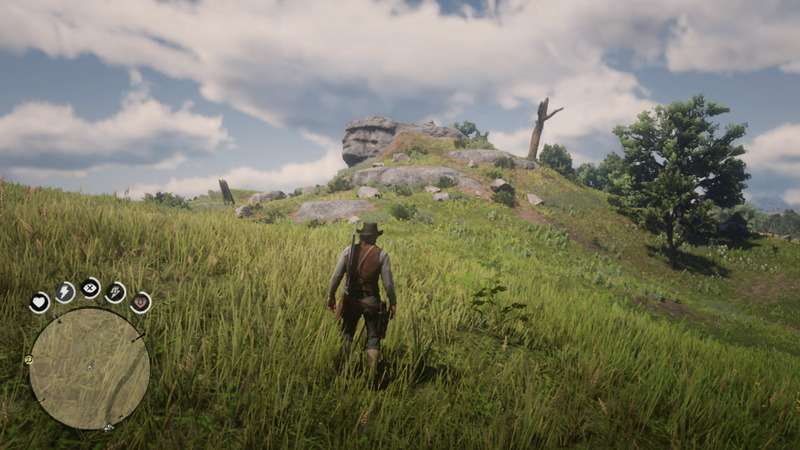 Just North of Rhodes is an interestingly shaped rock face (kind of like a mini Mount Rushmore) where there's a dead tree on the right side (coincidentally like the picture in the map). 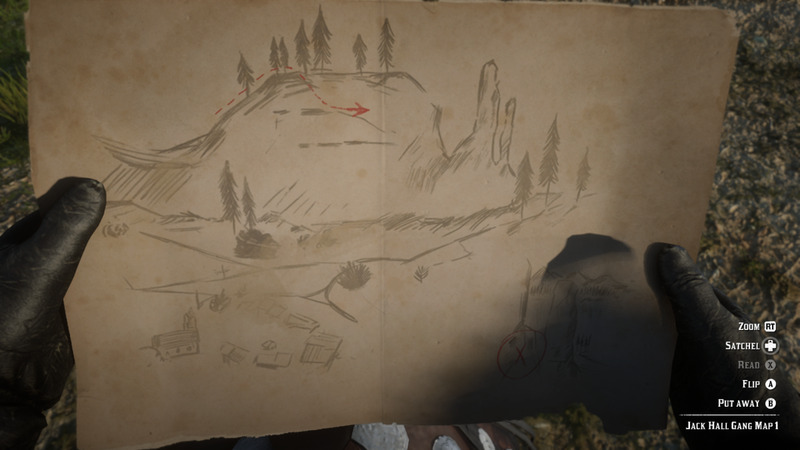 Ride up and around the right side of Face Rock, where you will find another dead tree with the next piece of the map (plus a small treasure) inside. Lowly Worm has seen better days it looks like. Someone had a lot of time on their hands. The location West, and slightly South, from Van Horn Trading Post. 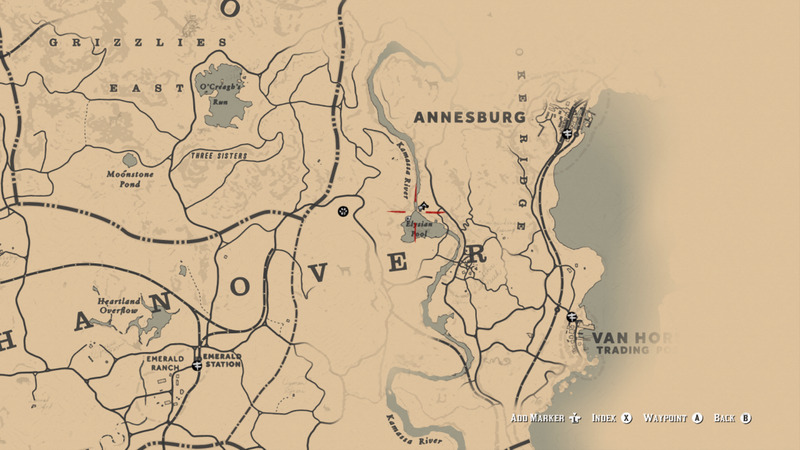 Take a train to Annesberg then ride South to Van Horn Trading Company (shame you just can't take a Stagecoach directly there without discovering it). Ride West, and a little bit South into the hills. 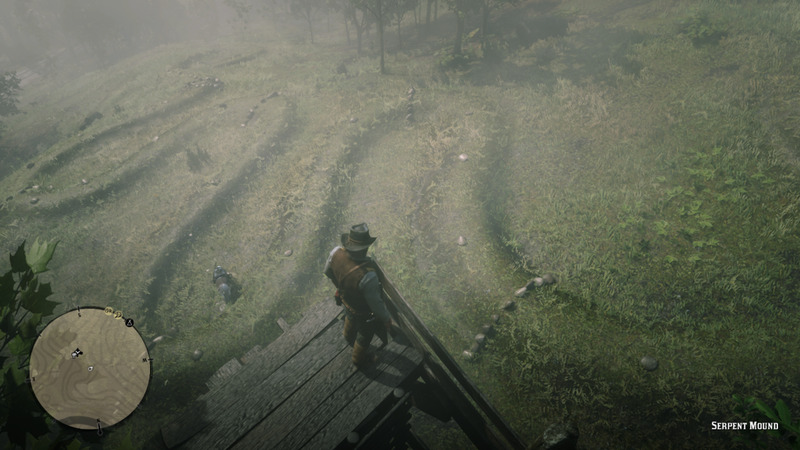 You'll come across this strange land formation in the above second screenshot. The Serpent Mound has the next piece of the treasure in the "sculpture's" eye. Go ahead, stick your hand in there. 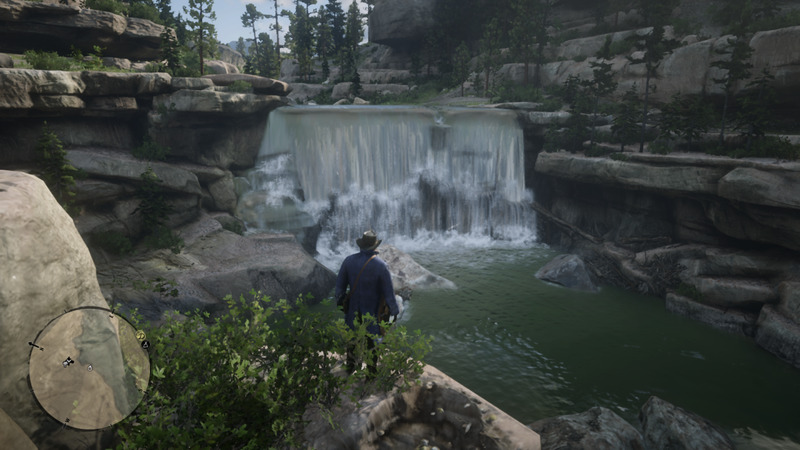 Fun fact everybody; this was the last waterfall I checked when I went hunting all over the map for this treasure the first time. Yep it was just one of those things. The next location is at Elysian Pond. 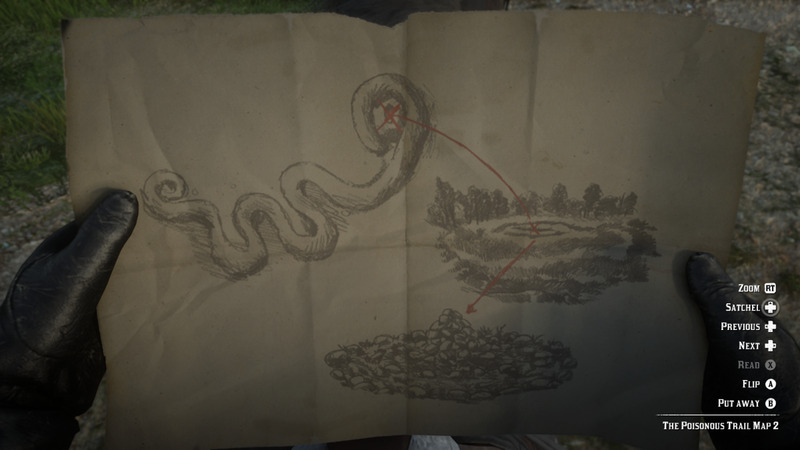 Conveniently just North from that serpent... seriously what the hell was that!? Doesn't matter HOW you you get behind the waterfall, just go right through it. 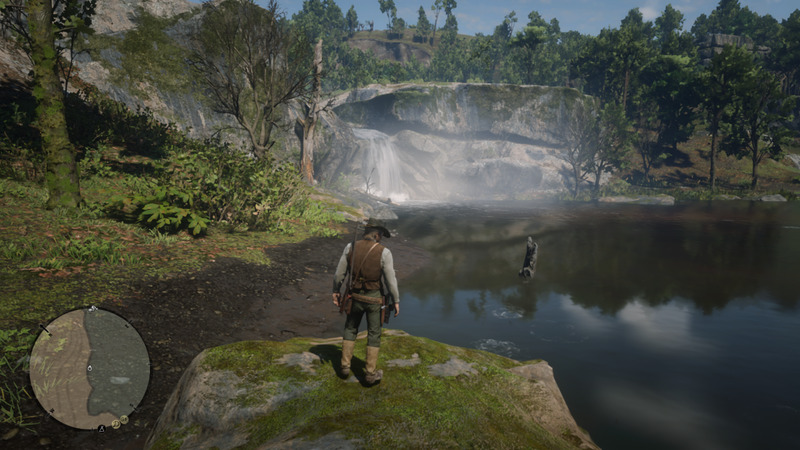 Just try not to swim in the pond, this place is gross! Run through the waterfall and follow the tunnel until you find a dropoff on the right. Drop down and crouch to go through a small tunnel here (see first screenshot below, I'll give you this one). 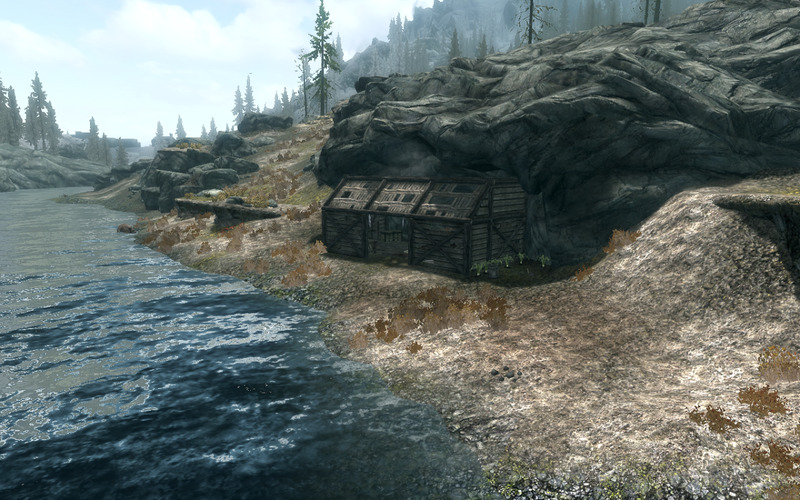 There will be a small camp on the right with a Lockbox but obviously THIS isn't the treasure you seek. FROM THAT CAMP make a right and follow the tunnel. You will come to a large open room with a drop.Follow the ledge to the left and jump down to the platform below (if you go to the right you'll slide down to your death, thanks a lot physics engine...). 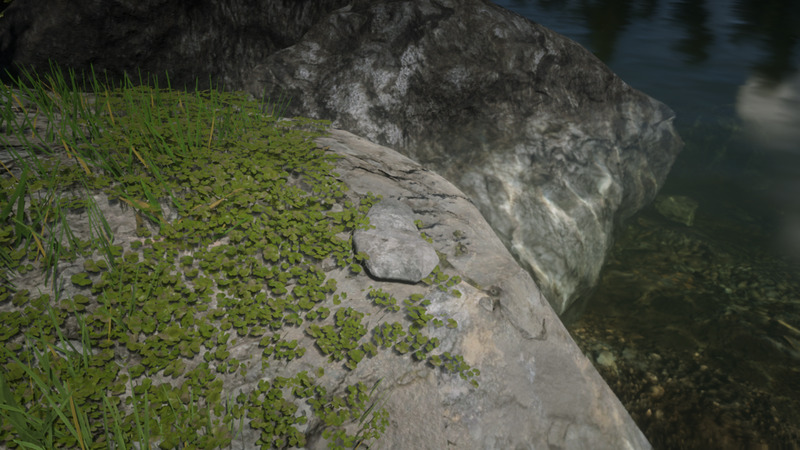 Walk up the slope to the left (see second screenshot below) and you'll slide into the some water. The treasure is on the left behind some rocks. 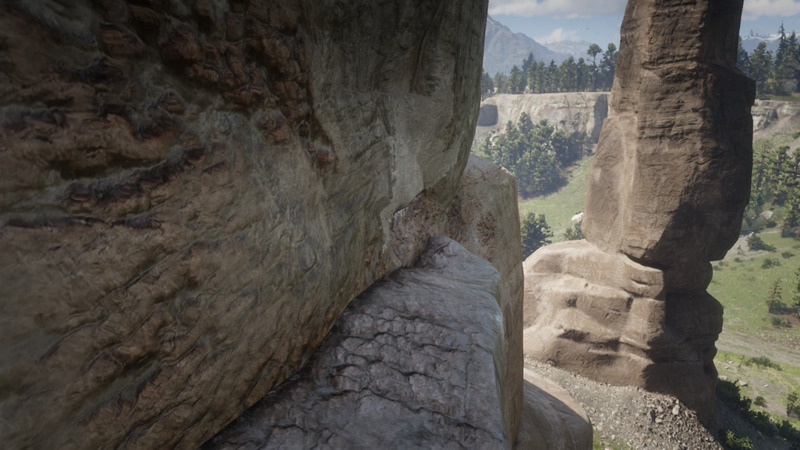 To get back out of the cave, climb back up the slope and use the ledge on the right (also in the second screenshot) to get back up to where you were. From here follow the cave back the way you came (don't bother going to the left that's part of Stranger Quest later in the game). After you drop down into this area crouch to go through this tunnel. Leap down to this ground and follow the cave down the slope. Also that little platform on the left? You're gonna climb to get back out of here. Kind of Elder Scrollsish isn't it? The treasure is among this pile of rocks and will be on your left when you descend the slope. So like the above hunt we're gonna be going against TLC's advice yet again. The waterfall is just South-West from Valentine along the Dakota River. Or "down that there Dakota way" if you want to get period specific with the directions. Cross the Dakota River and run along the right side (facing the waterfall). Before you go along the fallen tree, and walk through the waterfall, you might want to switch to first person. I typically play in third with the camera all the way out so the results might be different for you. Despite how much water is covering your screen turn left and press X/Square to climb. 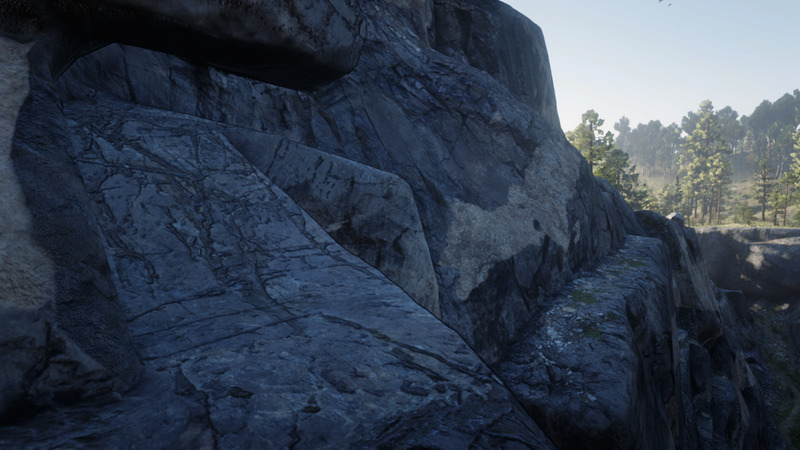 Head along this ledge and you'll see an alcove on the right where you'll find the next map. See that pile of rocks? No the one on the right. Yeah. The treasure is there. To the right of THAT. Another island in another lake ffs. What is this Poisonous Trail in reverse? You passed by Barrow Lagoon during that long dredge of a tutorial known as Chapter 1. Realistically this wouldn't be safe. Ride up along the dotted trail, past the cabin and grave site of that figure skater dude, and dismount near the base of the ridge. You can climb up a small trail that will help you get to the top of the ridge. 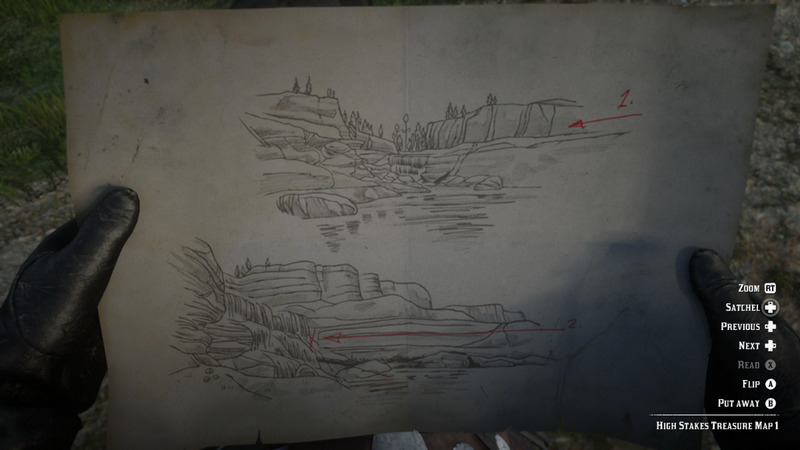 The map tells you the next map is on the actual island, but it's really inside the log that acts as a bridge to the island. 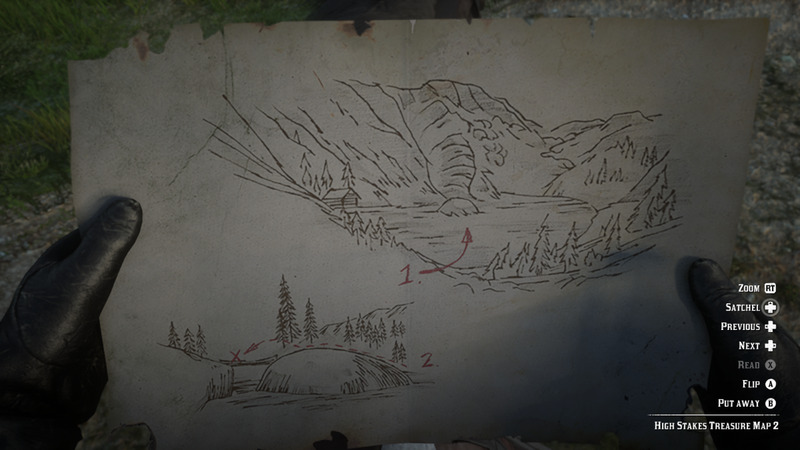 Is there something of note on the island? I can't remember, BUT ironically when I was looking for the final piece of the Jack Hall Gang Treasure I thought it was here. There was a bit of trial-and-error while writing this article, hope you folks appreciate that. The next map is in the middle of this fallen tree, that acts as a bridge to the island. It was nice of them to give us directions this time. 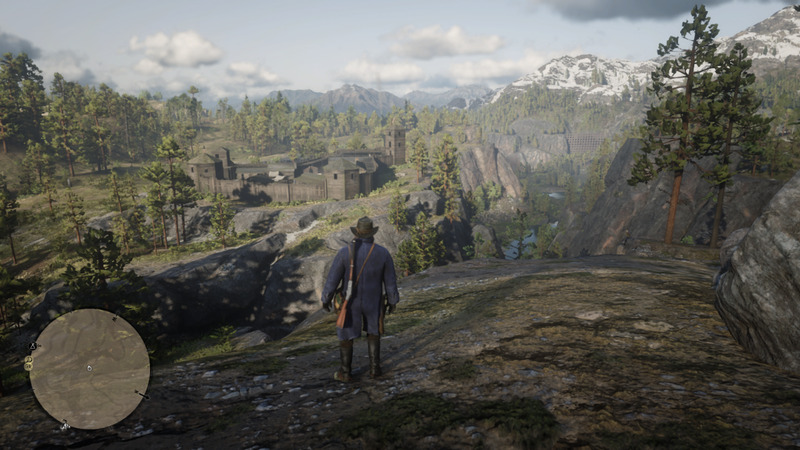 The direction you want to go is BEHIND where Arthur is standing, but I wanted to get a shot of Fort Wallace (plus this view is nice). Follow the directions as they are written on the map, until you get to the pathway (you're gonna need my help from here obviously...). Make a left and IGNORE that ledge below on the right, I've made that mistake a couple times. You'll come to a fork, a slope going up on the left, and one going down to the right. The slope on the right has a Rock Carving, but the path to the treasure is on the left slope heading up (see first screenshot below). 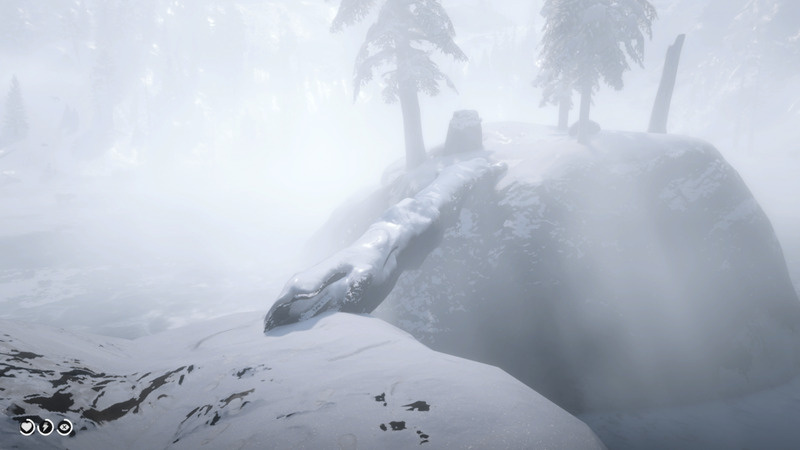 Crouch walk along the ledge carefully since sometimes Arthur will slide unexpectedly off the cliff face (because physics engine that's why!). 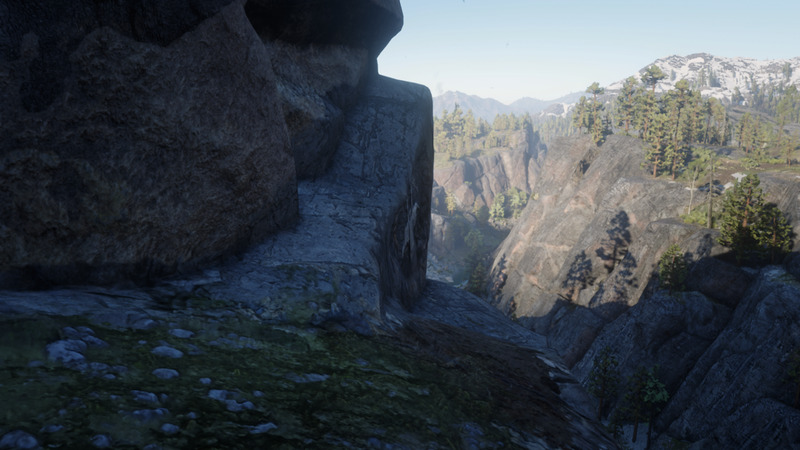 Keep following the ledge until you come to the spot in the second screenshot below. Don't make my mistake and try to sprint+jump that gap on the lower right, that's actually your path back up to where you started. Instead continue following the ledge to the left, crouching under the low cliff, and the treasure will be tucked away in a crevice. Hold X/Square to Search and you'll be three Gold Bars richer. 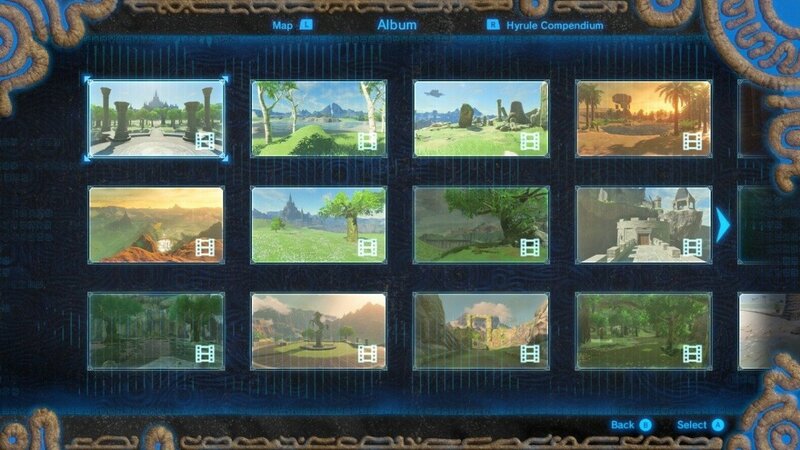 You have now completed all ten Explorer Challenges. The fork in the path you come to. Lower slope, on the right, leads to a Rock Carving. The upper slope on the left is what you want to follow to get the treasure. The other "fork". DO NOT try to leap onto that lower platform, if you make it you'll have to start this mini adventure all over again. Crouch walk up the slope to the left. 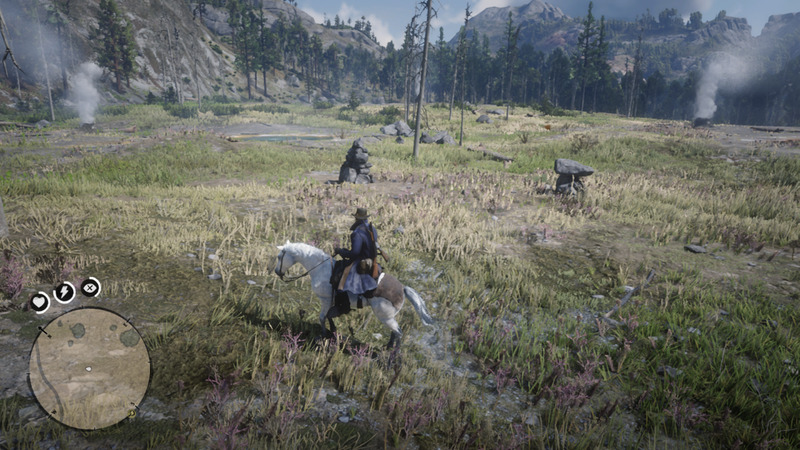 As you were riding around exploring did you some times come across a severed body? (No? Well check the screenshots below). 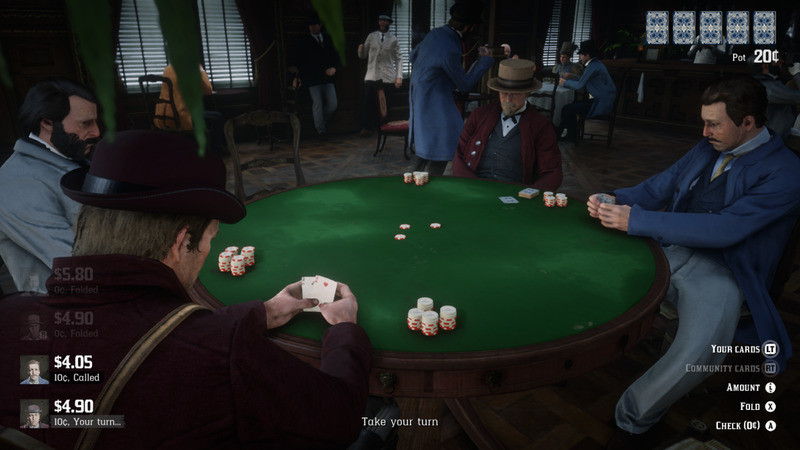 One of the many Stranger Quests in Red Dead Redemption 2 is only unlocked once you collect three pieces of a map. Each piece is in the mouth of the body's severed head. Yep, that's right. Now for the sake of sparing my readers graphic content I won't post screenshots of the murder scenes (not to mention I think I've overdone my screenshot quota as it is). 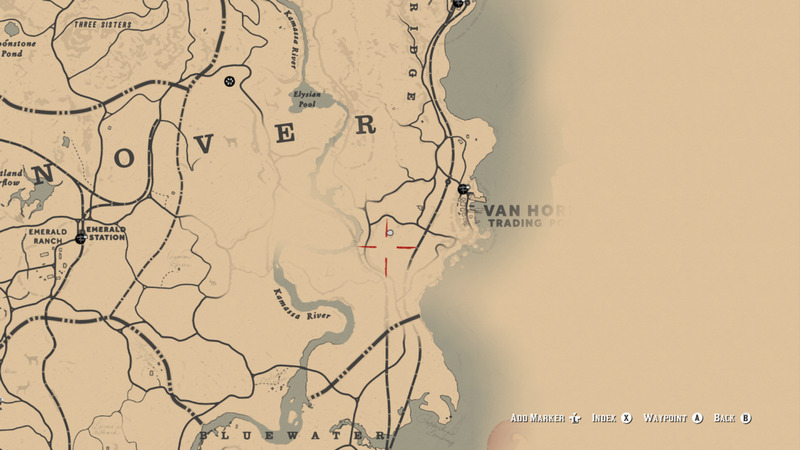 However I will post screenshots to the locations and let you discover the rest for yourself! 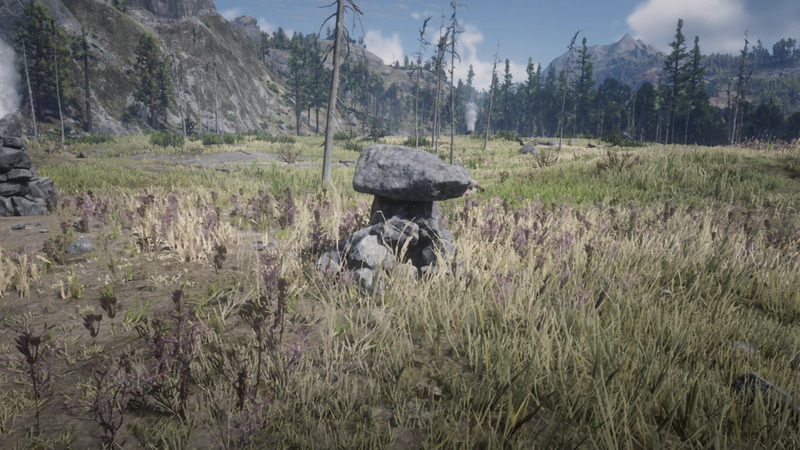 Just under the train tracks, chances are you'll come across this body while travelling between Dutch's Camp and Valentine. The second victim near Wallace Station. 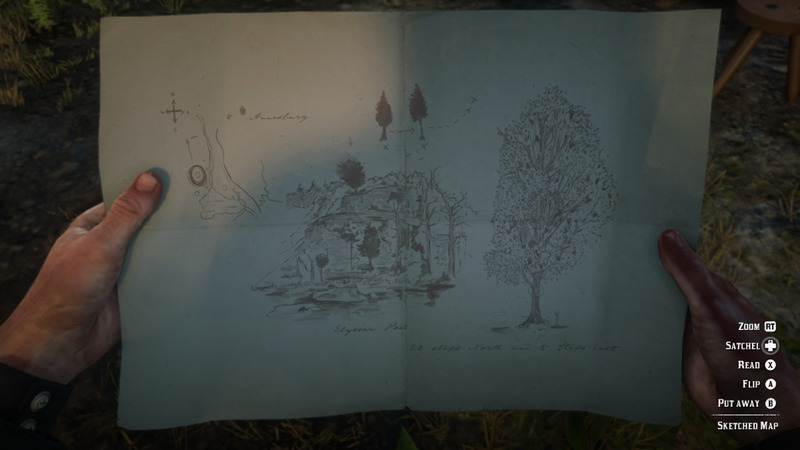 Third victim might not be discovered until Chapter 3 (depending) but is hanging from a unique tree to the East of Braithwaite Manor. Head West from Valentine, that's all I'm saying. Enjoy the rest! Another unofficial Treasure Hunt (and no not linked to the Explorer Challenges, but it's pertinent because I say so!). There are two hermits on opposite sides of the map; both very hostile, both have neat stuff to loot, and both would probably be a lot happier if they found each other on Tinder or something. Of course that never really worked for me, and I almost caught something because of a girl from Salisbury (see that's how you do "not pertinent" information). 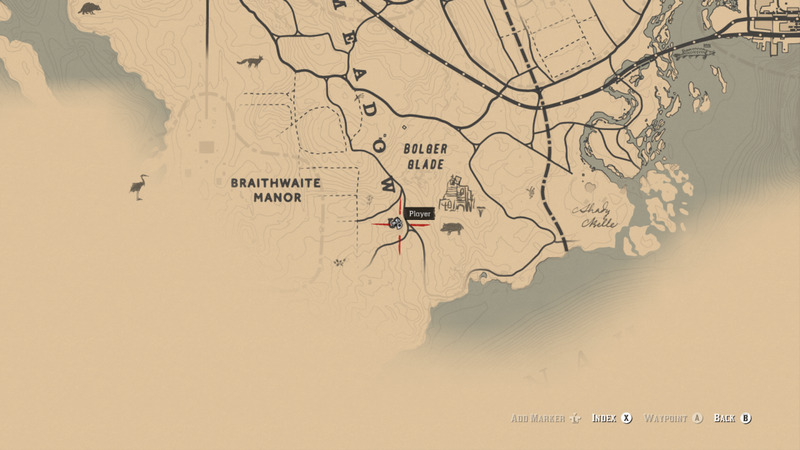 Keep in mind you can visit them both at any point, but unfortunately you can't hunt for the treasure until during the Epilogue. (At least I think maybe you can find it early, I need to test that.) 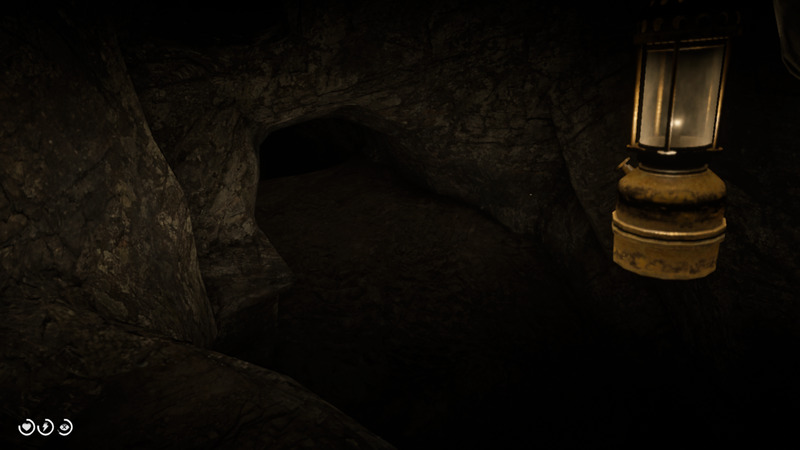 Not to spoil it for you, but the loot you get from the Hermits is actually more valuable than some gold plated Schofield, but if you're a thirsty 14-year-old you might like the other stuff in the treasure chest too. To each their own. The Female Hermit lives here, like the sign says Beware of Dogs. The Male Hermit lives here, ready to give you a double barrel welcome. You can find the treasure here in the criminally underused state of New Austin. 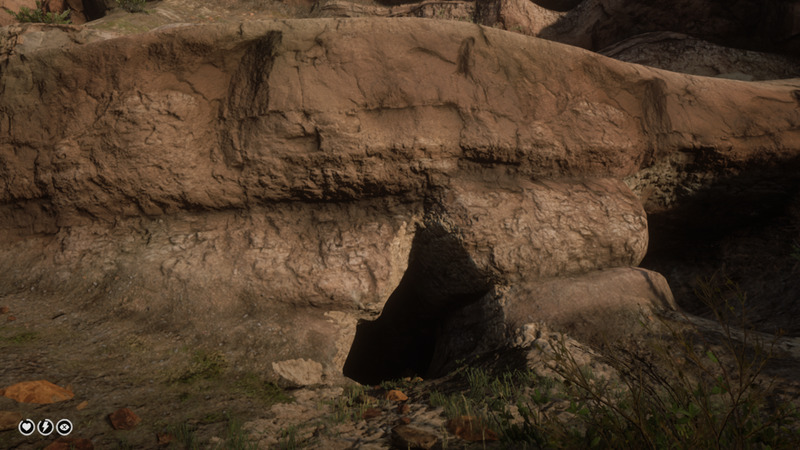 The chest is in this cave. 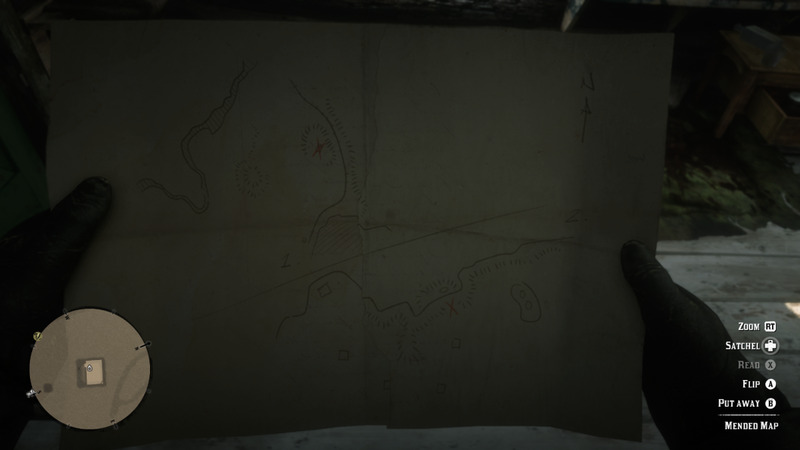 At a homestead, Reed Cottage, just North of Annesburg you can find a Sketched [Treasure] Map hidden in the chimney on the left as you enter. 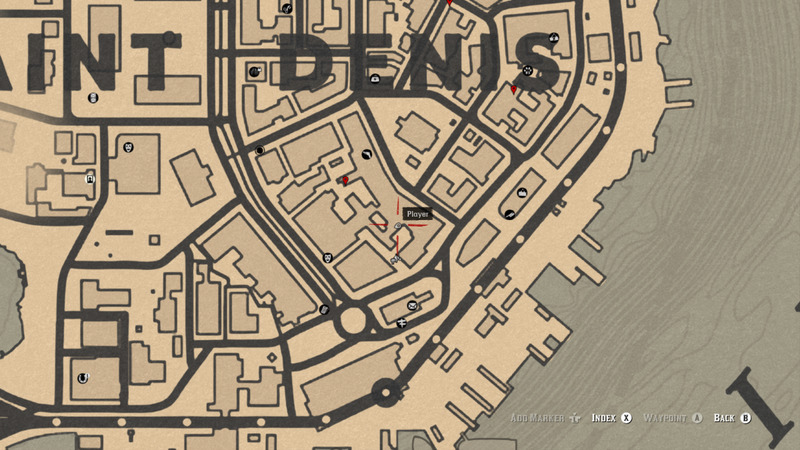 You can easily ride past it on several occasions while riding North (following a Waypoint) from Saint Denis. It will have a well out front and a red trim. 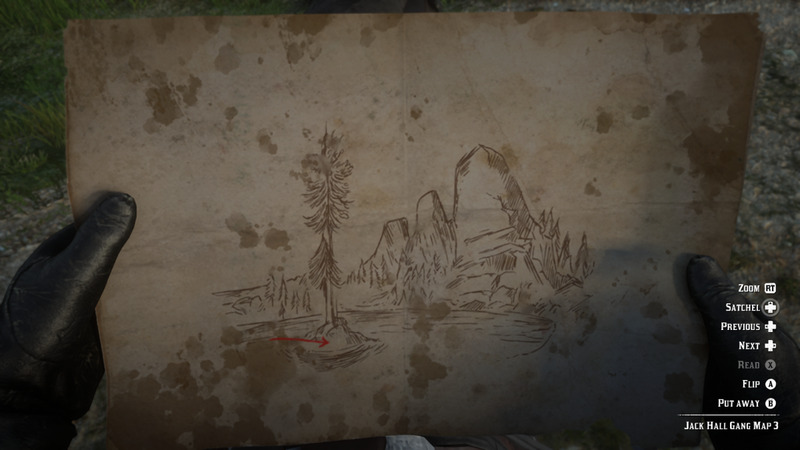 Go to the ridge (to the left of the waterfall associated with the Poisonous Trail Treasure Hunt) North-West of Elysian Pond where you'll find a tree with an "X" carved into it. From that tree follow the directions on the map to the letter. 20 steps North, then five steps East. 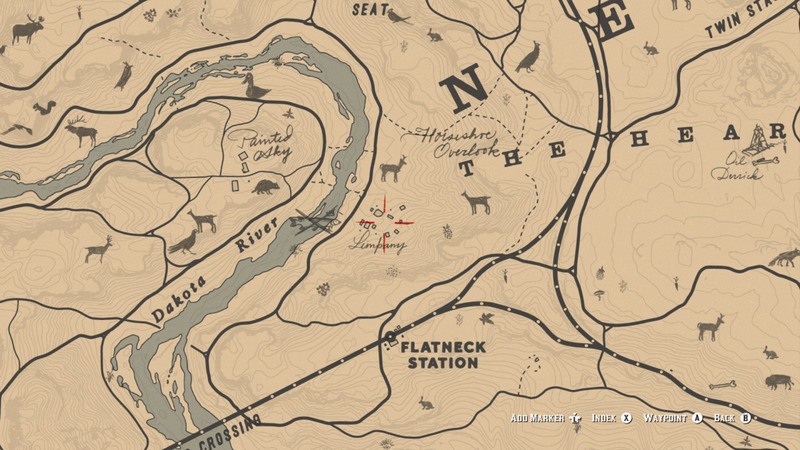 Search the rock to find a Gold Bar. 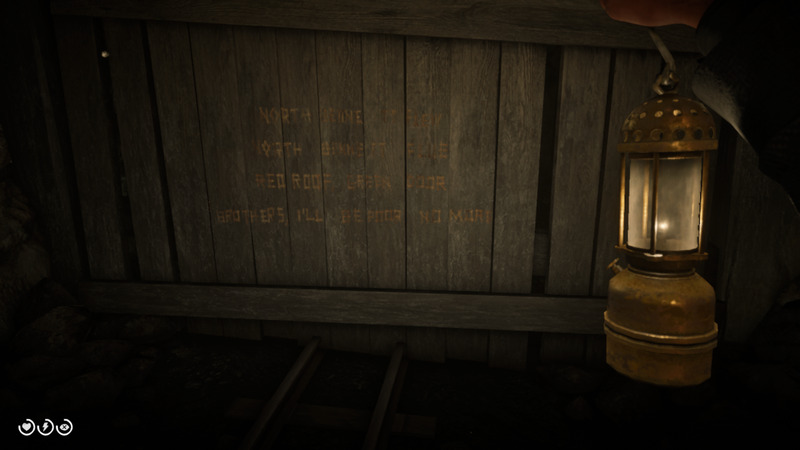 In the mines of Annesburg is a poem etched into a wall relating to this treasure. 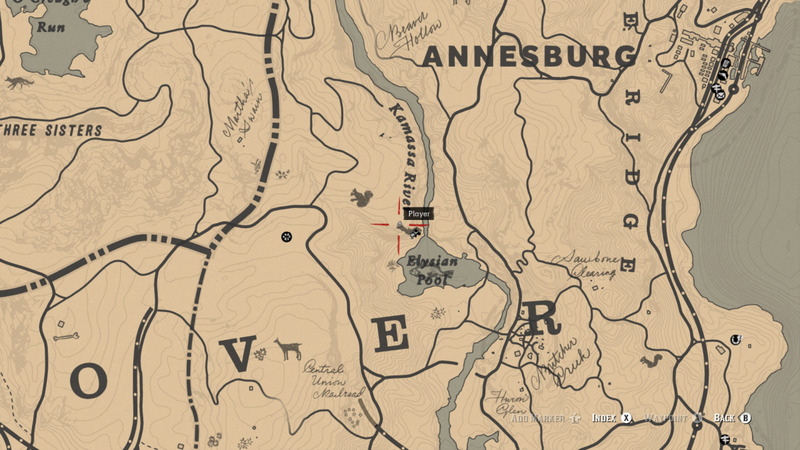 Reed Cabin is just North of Annesburg. Not sure where to start with this map? Just North-West of Elysian Pond, up on a ridge you can climb from the West side via a slope. 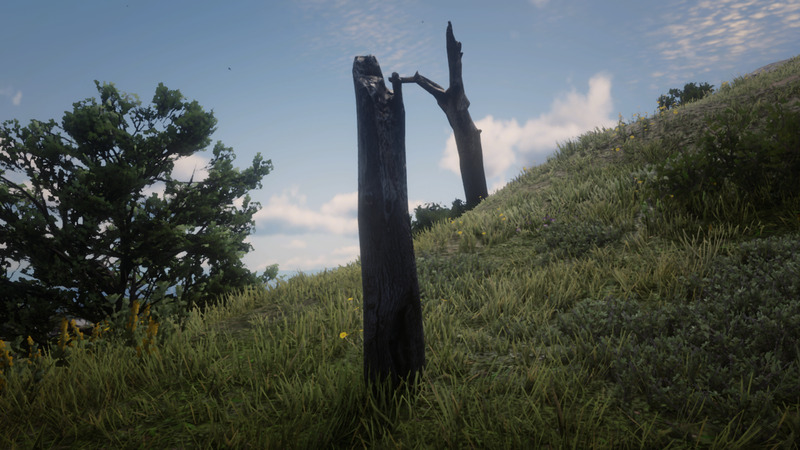 The tree with the "X" on it. 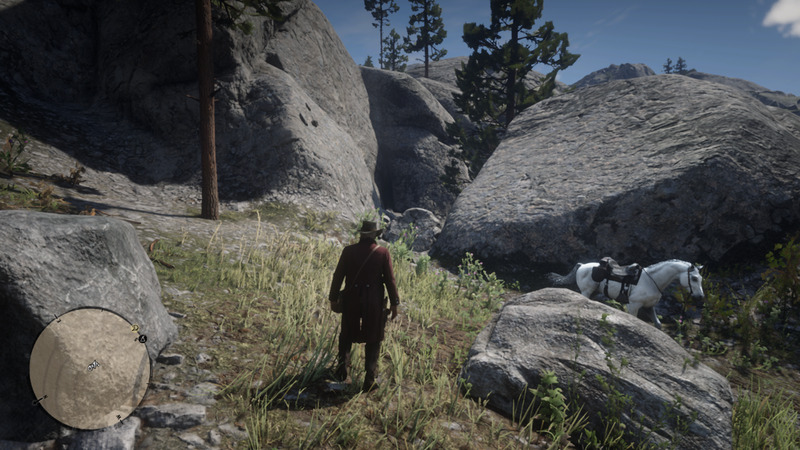 I'll give you a hint, the rock you need to search is somewhere in this screenshot. 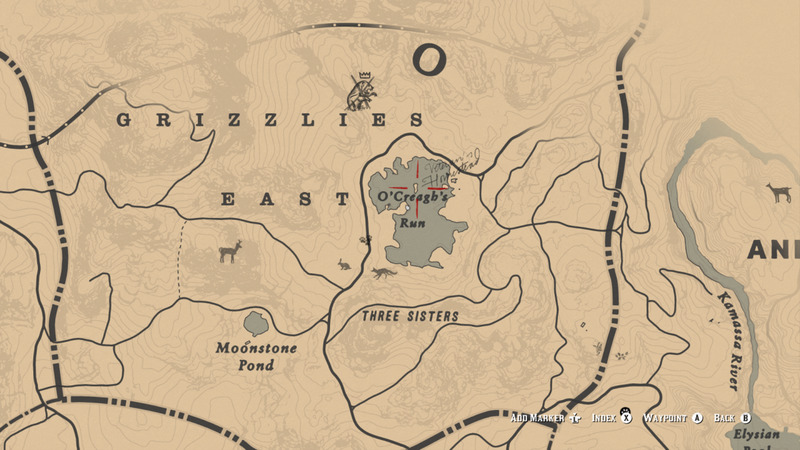 Like the Otis Miller Revolver this treasure hunt involves a unique weapon but not necessarily treasure. 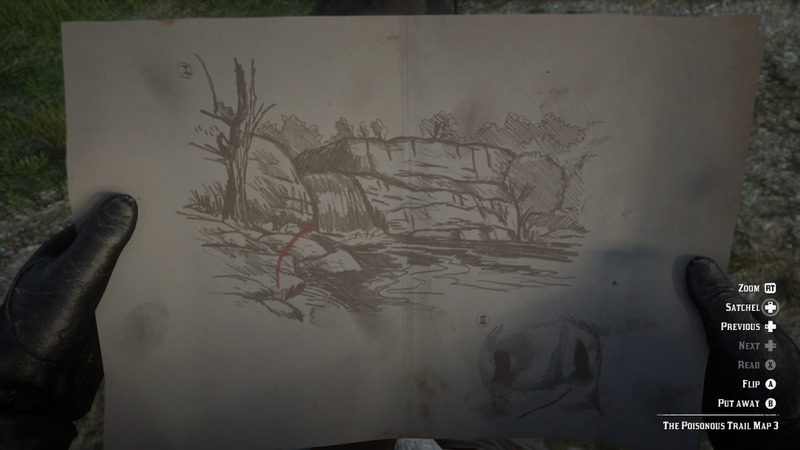 So for that I've probably just lost your attention, but this is a cool little Easter egg that involves some exploration. 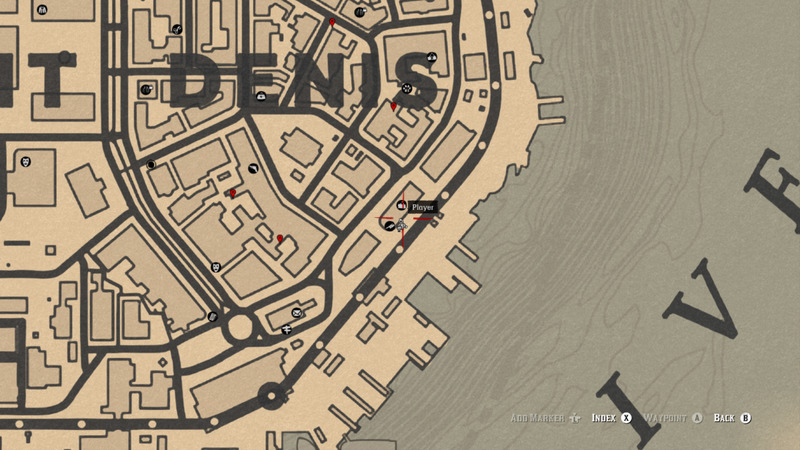 Around Saint Denis are five graffiti poems etched into the side of buildings. 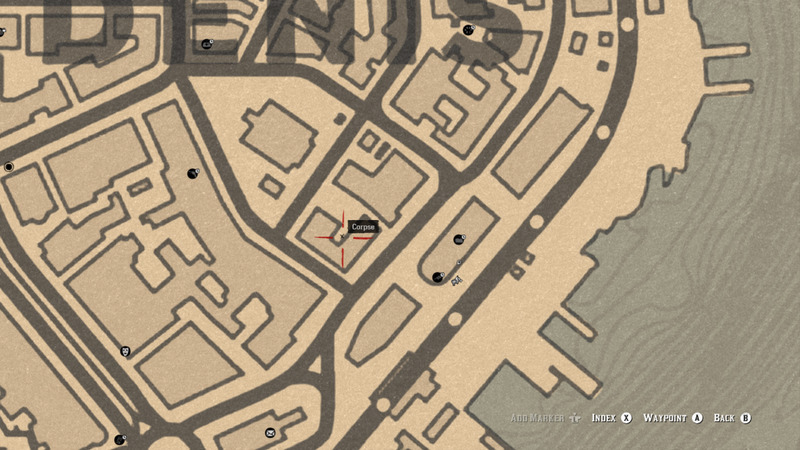 When you find one (don't worry there are screenshots below) hold the Y/Triangle to Inspect it while standing nearby. Once you find all five get a room at the big Saloon and sleep until Night. The Vampire only appears between 12 and 1AM. That's two real-world minutes to rush out of the room (best if you just jump over the balcony) and head to the location South-East of the cathedral. 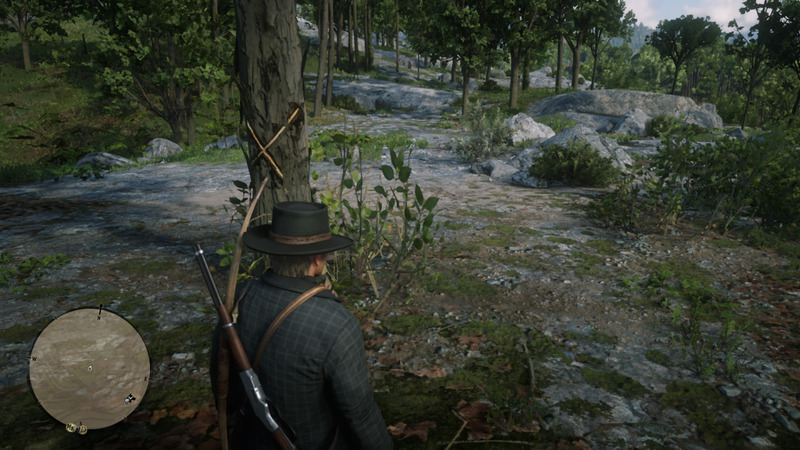 If you see an "X" indicating a corpse on the mini-map then the random encounter will trigger. 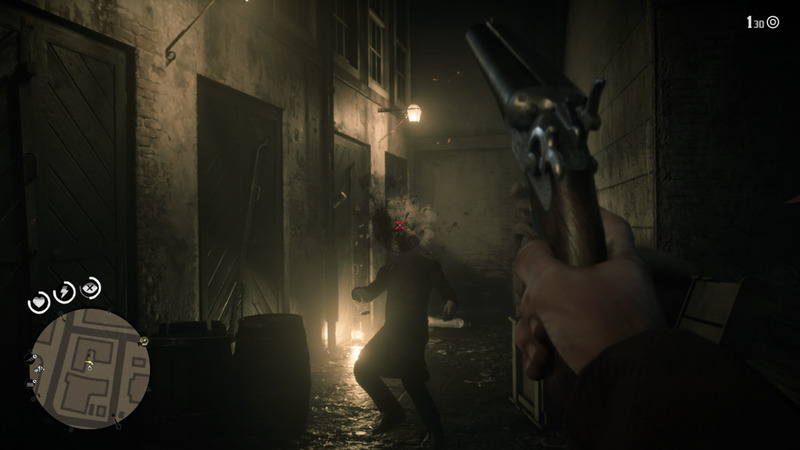 Go into the alley and talk to the Vampire or you can just shoot him, but there's no fun in that. Once you do make sure to pick up the Ornate Dagger. This graffiti is the right of the Butcher Shop to the left of the General Store's East entrance. To spot this graffiti go into the alley across the street from the Post Office/Train Station and make the first right. Inside the gated alley, on the left, is the next etching. To the left of the Gunshop entrance is an alleyway. The next etching is on the right as you come to a pair of stairs. Just across the street from the small Saloon (not the big one with the hotel room, the little one with the rat problems). The graffiti is on the corner of the red building. As you're facing the West entrance of the market you will see a gate to the right. In this little alley the graffiti will be above a box on the left as you go through the gate. Once you have all five etchings the vampire will spawn here after midnight. Team Edward? Team Jacob? I'm team Caan. 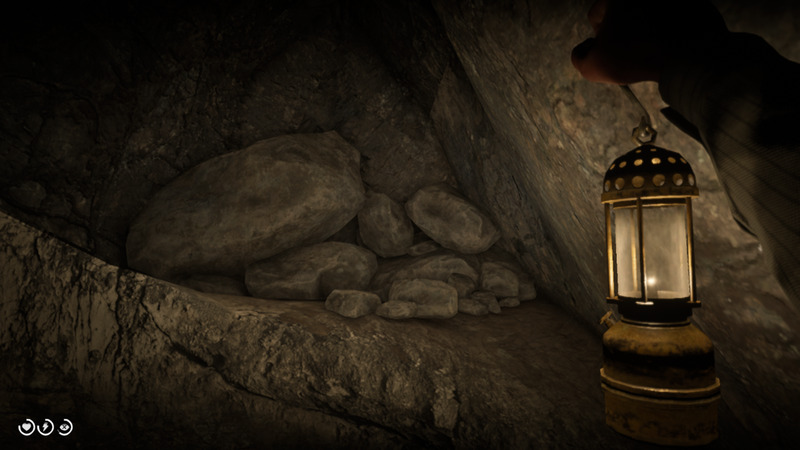 Apart from the Treasure Hunts there are a few Gold Bars that can be picked up through exploration of secret areas. I'm gonna warn you right now, I'm going to be vague on purpose, but still point you in the general direction. I don't want to ruin the fun of your hunt for gold. Also because I'm sure it's going to frustrate someone, but hey I'm not a successful Youtubers that ruins everything for everybody. Try to enjoy discovering this stuff for the first time, so that you know how lost I was....Don't worry though I'll walk you through that Strange Statues puzzle below. Up by Window Rock in Ambarino is a rock carving (that actually doesn't count toward the overall Rock Carving Collectible) that depicts a selection of Strange Statues. Finding this mural is not required to do the puzzle but the information is helpful. You need to press a button on the front of the statues with prime numbers. You can tell what number the statue is based on the amount of fingers it has; so that statue that looks like is flipping you double birds? That is a "two". Select two, three, five, and the statue with one arm to unlock a compartment in the center sculpture containing three Gold Bars. 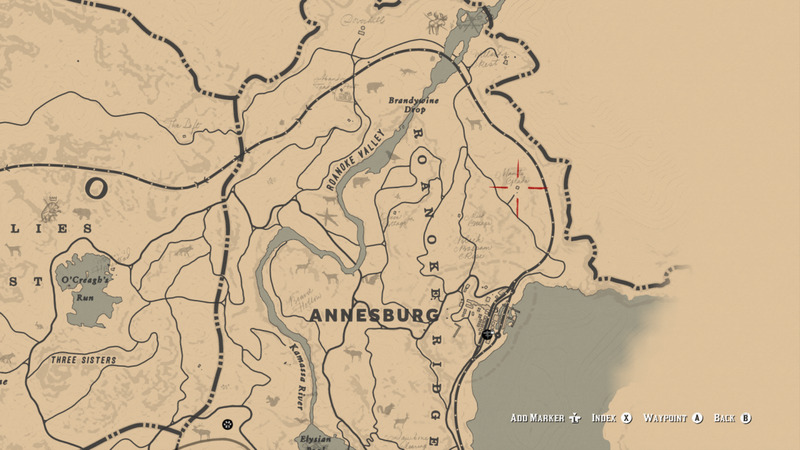 One Gold Bar: In the burnt ghost town of Limpany (see first screenshot below). 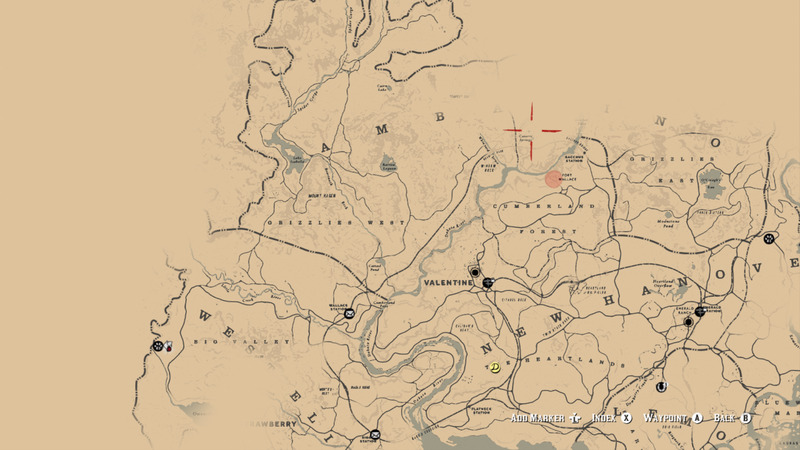 This Gold Bar is connected to some glitch/exploit that I do not know and do not want to know. 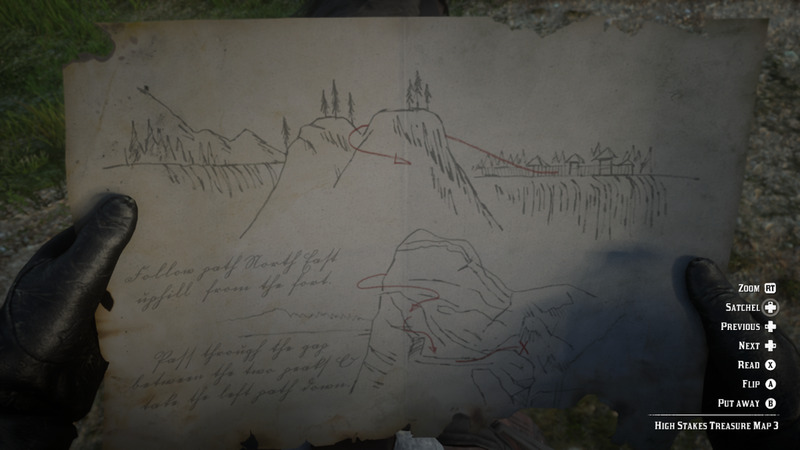 One Gold Bar: As apart of the above Sketched Map unmarked Treasure Hunt. 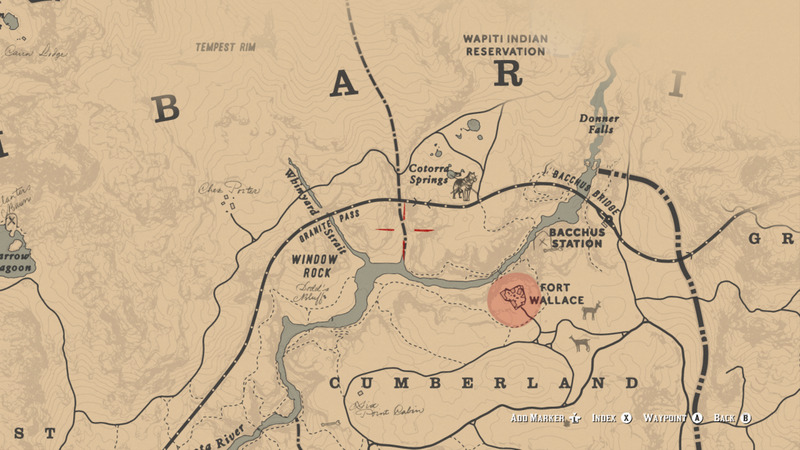 Two Gold Bars: At the site of a train crash North of Cumberland Forest, North-West of Fort Wallace (see second screenshot below). Three Gold Bars: After solving the Strange Statues puzzle. 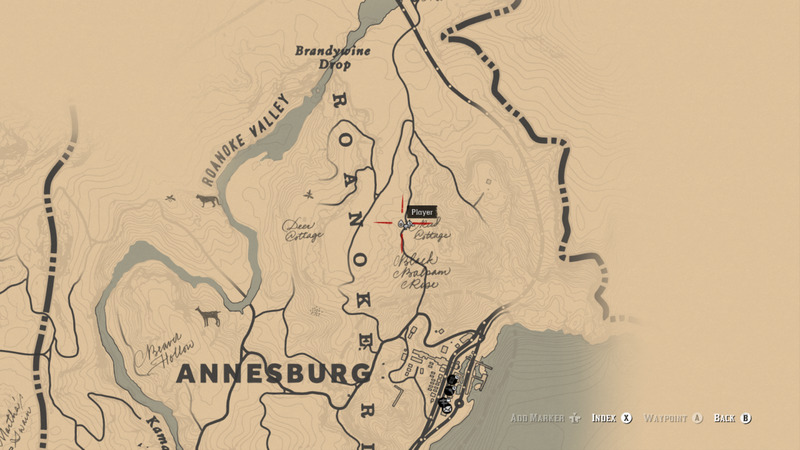 Six Gold Bars: As part of the above mentioned Explorer Challenges/Treasure Hunts. 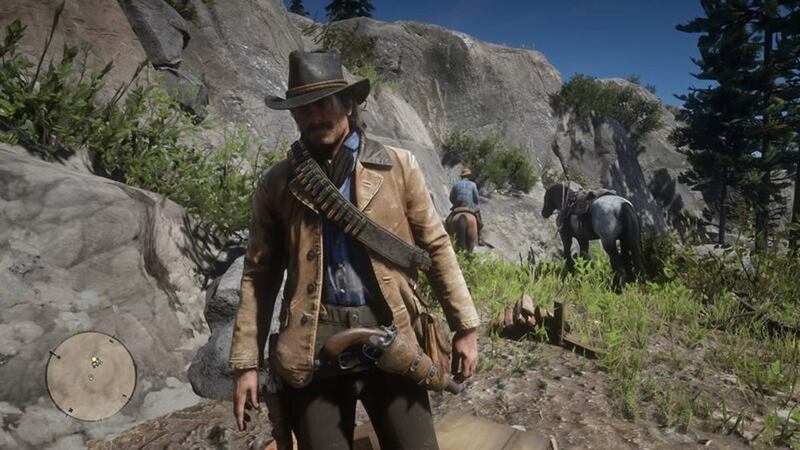 One Gold Bar: Awarded at the end of the Chapter 2 finale mission "A Strange Kindness". 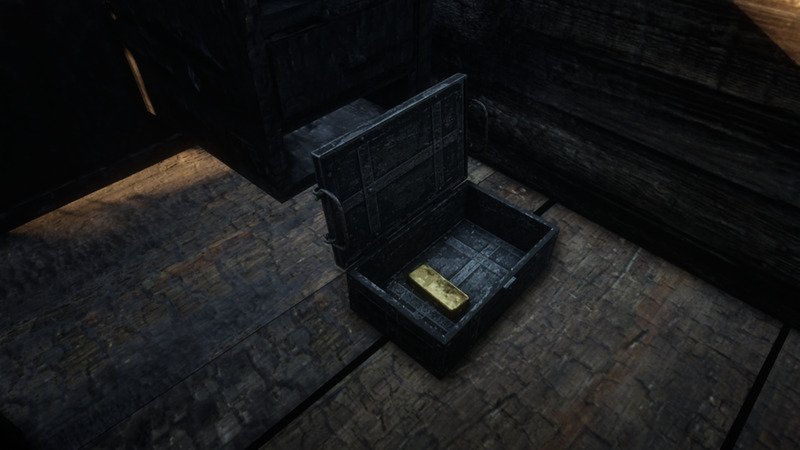 One Gold Bar: At the beginning of Chapter 4 return to Braithwaite Manor. There's a Lock Box to the left, on the other side of the wall, of Catherine Braithwaite's corpse. 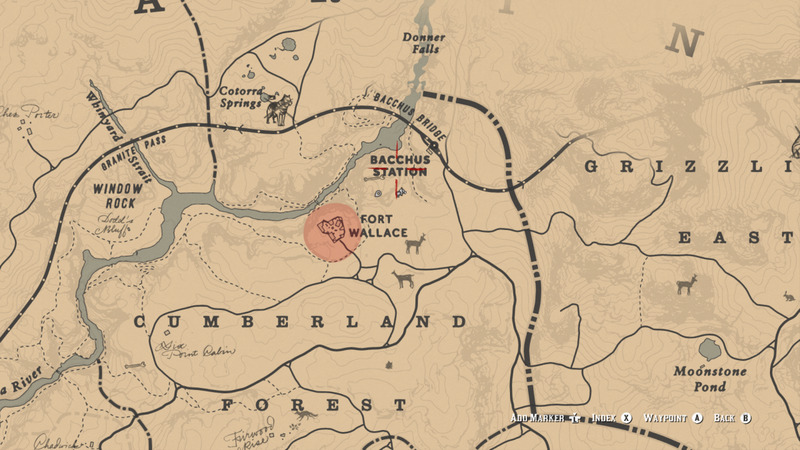 Great place to get a money boost in Chapter 2, just West of the Gang Camp is this burnt ghost town. Gold Bar is in one of the building's (hint: I used it as the cover photo for this article). 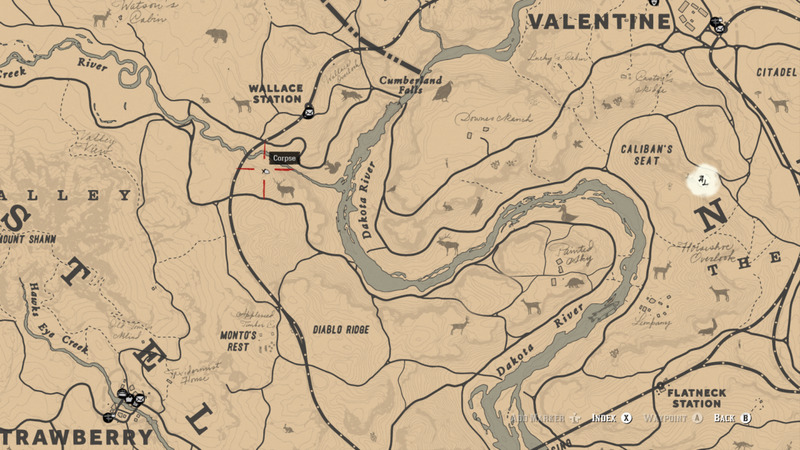 A crashed train here-ish (North-East of Valentine). 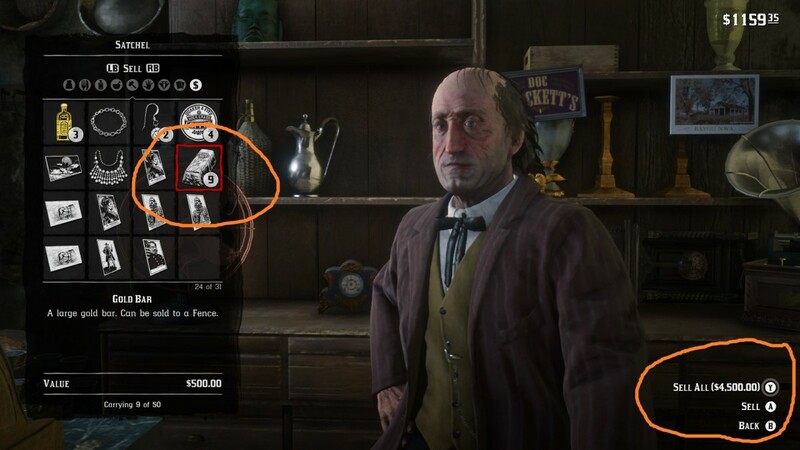 Besides the Gold Bars there are some other valuables, good luck! 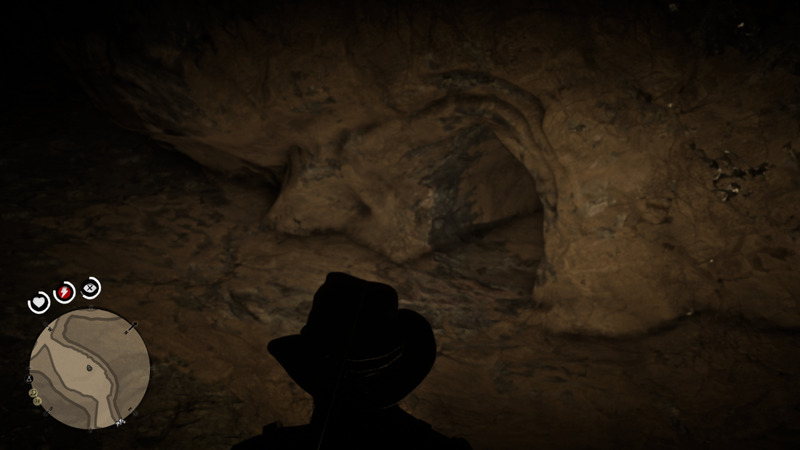 The location of the cave with the Strange Statues and Gold Bars. The entrance to the cave with the Strange Statues. I am playing Red Dead Redemption and I found all the gold bars and all the maps yet the Explorer Challenge is stuck at Challenge 8! What can I do? Sometimes the game doesn’t register the High Stakes Treasure Hunt. 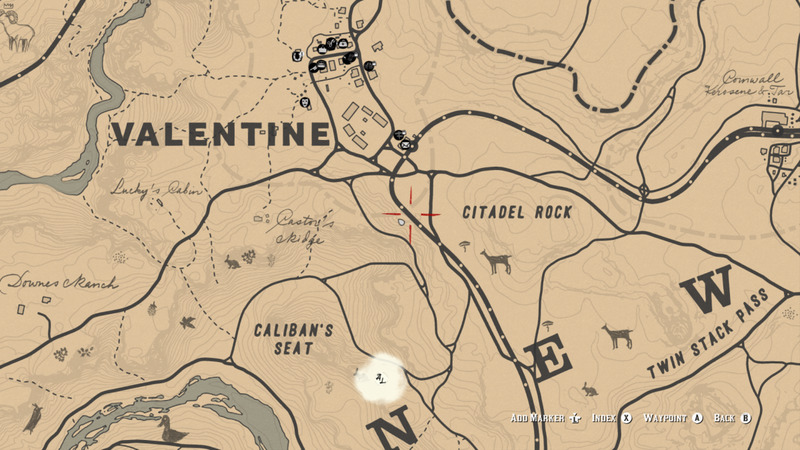 Go back to each of those locations and see if you have the option to redo THAT Treasure Hunt.